I haven’t been posting much lately. What I have been posting has been other people’s stuff rather than any original thoughts. I’ve been pursuing several different topics but I can’t post about them because they may end up being used at work. Anyway, if you’re looking for lots of interesting graphics links, you should start/keep reading the Real-time Rendering blog. You should read the Real-time Rendering book too (though I haven’t got a copy myself, yet). From here on out I think I’m just going to stick to posting things that I am doing myself and content related to it. Edit: I should add that the title “What’s going on here? !” is referring to what’s been going on with the blog. It’s not a request for people to guess what is going on in the picture (but you can do that too). No sir. It’s analytic. And runs at over 100 fps. You’ll have to check out the book when it comes out (or at least until I check my author agreement.. which I’m sure says I can’t post about it here). Nein. 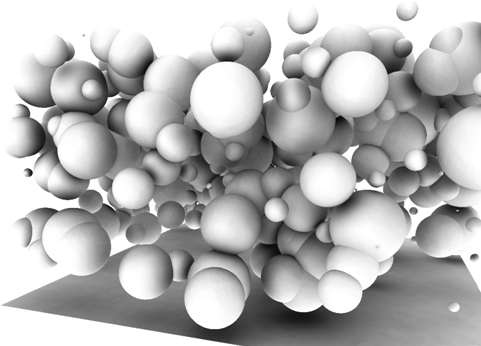 It is dynamic and constructing/sampling a distance field every frame in under 10ms would be difficult. Even if you computed it at discrete 3D points and interpolated distance values. Plus you’d have to compute it at a resolution higher than your smallest object. That looks great. I’m looking forward to reading about it. Got a color version (color bleeding or just occlusion)? Dynamic and fast, so then perhaps you are computing a rough analytic representation of occluders per object from a GPU side hierarchical tree structure of the scene… expecting in the future some more interesting GPU side logic and structures after that Froblins demo. Looks great! But, what about indirect lighting (color bleeding)? Hate to disappoint but this is occlusion only. 100 fps on what hardware?